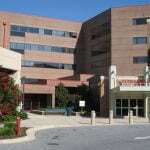 MacKenzie Commercial Real Estate Services, LLC is proud to announce they have been awarded the listing assignment for The O’Dea Medical Arts Building, 7505 Osler Drive, Towson, Maryland, a Class A medical office building situated on the campus of University of Maryland St. Joseph Medical Center (UM SJMC). The MacKenzie team of Joe Bradley, Matt Mueller, Meghan Roy, and Henson Ford will be representing the owner to lease the remaining space. Situated just off Osler Drive inside the main entrance to the hospital, the 100,000 square foot building offers available spaces ranging 1,000 to 6,200 square feet. The current tenant roster includes specialties such as cardiovascular, vascular, dermatology, spine, podiatry, and more. Directly attached to the building is covered parking, allowing more accessibility for tenants and visitors. “The O’Dea Medical Arts Building offers tenants first class medical office space on the campus of one of the region’s most reputable hospitals. We are honored to have this opportunity and look forward to expanding our relationship with the hospital as we work together to ensure a strong tenant mix in the building,” stated Joe Bradley. For more information on the O’Dea building, please visit www.mackenziecommercial.com. For leasing inquiries contact Joe Bradley at 410.494.4892 or jbradley@mackenziecommercial.com, or Matt Mueller at 410.494.6658 or mmueller@mackenziecommercial.com.